Clothes dryers are an everyday household item that can pose a serious risk of fire if they are not properly maintained. A clothes dryer operates by blowing hot air through a revolving drum. As clothes are dried, lint is produced as water is removed. Lint accumulation, in the dryer and in the dryer vent, can reduce airflow and create a highly flammable fuel source. Clothes dryer fires account for over 15,000 structure fires, 15 deaths, and 400 injuries annually. 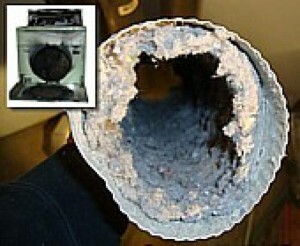 “Failure to clean” is the leading factor contributing to clothes dryer fires. Make sure you clean the lint filter before or after each load of laundry. Remove lint that has collected and around the drum. Rigid or flexible metal venting materials should be used to sustain proper air flow and drying time. Follow the manufacturer’s operating instructions and don’t over-load your dryer. Do not leave a dryer running if you leave home or when you go to bed. Never dry items that have come in contact with flammable substances, such as cooking oil, gasoline, and paint thinner, or alcohol. Keep the dryer area clear of things that can burn, such as boxes or clothing. Check the outdoor vent to make sure it is not covered by snow or obstructed.